Well, I didn't finish this by the end of March as I'd hoped, but I did get the watercolor quilt top finished. I'd like to put a 6 inch or so border around it, and am considering dark brown or black. What do you think? Unfortunately it is going back to UFO status because I have a bunch of other things I need to make before I'll have time to finish this one. There are more pictures and a bigger view, if you're interested, at my flickr account. Did you have a pattern for the watercolor quilt? 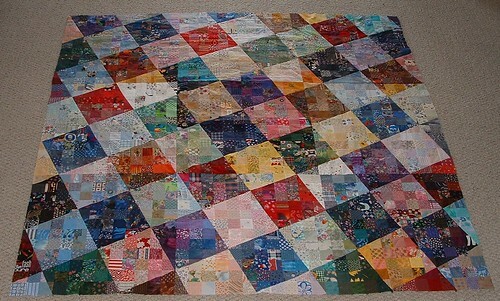 It is a great scrap quilt and I have lots of scraps! 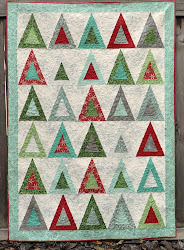 This is an absolutely fabulous quilt! I love how the colors blend in and out of the squares. This is incredible!!! It truly is! I vote for dark brown. That is gorgeous! I've never seen a watercolor quilt like that. Thank you for sharing.